One thing I love to do this time of year is catch the changing of the seasons along our Regional Trails. While great views can be had from any of our trails, I tend to gravitate to our less travelled, more rural trails for fall colors. While trails like the Cedar River, Burke-Gilman, and East Lake Sammamish have beautiful views of rivers and lakes, they also have a bit more traffic. 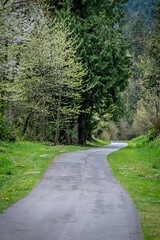 Trails like the Snoqualmie Valley Trail that runs from Duvall through North Bend along the Snoqualmie River Valley and into the foothills of the Cascades provide a variety of landscapes to explore without the crowds. Since we had recently installed a new kiosk panel at the Lake Alice Trailhead along the Preston-Snoqualmie Trail I decided to start there. Just past the town of Preston, on the way to Fall City, I followed Lake Alice Road up to the trailhead. There I checked out the panel detailing the history of the Lake Shore and Eastern Railway and walked along the old rail-line, which has since became the Preston-Snoqualmie Trail. I managed to catch the last vestiges of the falling leaves, all shades of yellow, green, and orange from local Bigleaf Maples, Black Cottonwood, and Red Alder. It was perfect timing as Parks’ crews had yet to clear the leaves from the trail, as they soon would, now creating a perfect blanket of fall colors across what had once been the the Lake Shore and Eastern track. I managed to get back to the trailhead, and my car right before an autumn squall briefly pummeled the trail in heavy rain. The smells of the changing season lingered with me and reminded me of the amazing gift we have in our Regional Trail System. What’s one of your favorite fall walks or rides? Leave it in the comments below. Don’t have one yet? Check out TrailFinder and explore #YourBigBackyard! Next Post What do you think of Your Big Backyard?